Welcome to the OurGroceries app! With OurGroceries you can keep track of your shopping lists and keep those lists instantly synchronized on all the smart phones & tablets in your household. You can also access those lists on your Amazon Alexa device, your Google Home, Siri, your computer, your Apple Watch, and your Android Wear watch. This user guide explains how OurGroceries works, so you can get the most out of it. If you don’t find the answer you’re looking for here, or if there’s a feature you’d like to suggest we add, please don’t hesitate to contact us. You might also find the answer to your question in our list of Frequently Asked Questions. OurGroceries is a mobile app that you can install on your iOS device (iPhone, iPad, or iPod touch) or Android device. It can keep track of multiple shopping lists and recipes. You can install OurGroceries from the app store on your phone or tablet. If you wish to receive early testing versions of OurGroceries for Android, you may do so here: Join testing program. You can leave the testing program at any time. When you first launch OurGroceries, you’ll see a list of your shopping lists and recipes. You can tap a shopping list to see its items. From there you can add items, cross items off, or edit details of items. Most people create one shopping list per store that they visit, such as one for “Safeway” and one for “Wal-Mart”. You can also create lists that aren’t store-related, such as a list of wines you want to buy (anywhere). And in fact some people create lists that aren’t shopping-related at all, such as a list of things to bring camping, questions to ask the pediatrician, to-do lists, etc. While looking at a shopping list or recipe, you can add items by tapping the “Add an item...” line at the bottom of the list of items. Alternatively, you can tap the “+” at the top-right of the screen. This will bring up the “Add an item” screen. On this screen you can type an item name using the keyboard, for example, “peanut butter”. You can then tap the “Add” button to add the item to your list. To make it easier to find items in the long list, just type the first letter or two of the item you’re looking for and the list will shorten to include only items that start with those letters. This also works with multiple words. For example, you can type “pe bu” to find “peanut butter”. Or perhaps you typed “cookie”, which listed all the cookies in your master list. You can add “ch” to that (making it “cookie ch”) to narrow the list down to just “chocolate chip cookies”. If you find an item on this list that you no longer want listed there, tap the at the right of the item name to delete it. Another way to add an item to your list is to uncross it off. See the next section of this guide for details, but essentially you can keep items crossed off between shopping trips and tap them to add them back to your list. While shopping you’ll want to cross items off your list as you add them to your cart. Cross items off by tapping them. This marks them with a horizontal cross-off line and moves them to the bottom of the list, in the section called “Crossed off”. You can tap them there to un-cross them off and bring them back to the top of the list. You can delete all items in your crossed-off section by tapping the “Delete all crossed-off items...” row at the top of the section. This will remove all crossed-off items from that shopping list. It won’t remove them from other shopping lists or recipes, or remove them from your item history (the list you see when you tap “Add an item...”). If you want more information about an item, tap the to the right of the item name. This will bring you to a screen where you can see and change various things about an item. To change the item name, tap into the box where the name is displayed and edit the text. To change the quantity of an item, tap the “Fewer” or “More” buttons. This will decrease or increase the count in parentheses after the item name. For example, if the item is “Potatoes”, tapping “More” will change the item name to “Potatoes (2)”. There’s nothing special about these parentheses and this number—they’re just part of the name like the rest of it. You can tap in the text box and edit the number directly, too. You can categorize items by tapping the “Category” button and choosing a category. Learn more about how to use categories. In the Android app, you can tap the barcode icon at the top of the screen to scan a product’s barcode. This feature is only available if you’ve upgraded the app. Learn more about how to use barcode scanning. For items in shopping lists, you can move them to a different shopping list by tapping the “Shopping List” button and selecting a different list. There’s currently no way to copy the item to a different list (and leave the item also in this list). To delete the item, tap the trashcan. This removes the item completely from this list. You can star an item by tapping the star button. There’s nothing special about the star—what it means is entirely up to you. For example, a star might indicate that you have a coupon for this item, or that this item is urgently needed, or that a particular person is responsible for buying this item. Tap the star again to un-star the item. Items that are starred will show a star next to their name in the shopping list itself. Finally, you can take a photo of the item, to ensure that your partner gets exactly the item you want. This feature is only available if you’ve upgraded the app. Learn more about how to use photos. The app is called “Our” Groceries because it solves the problem of a household needing to keep track of what needs to be purchased at the grocery store. Anyone in the household can add items to any list, and the next person to shop will automatically see what was added. For this to work, everyone in the household must connect their OurGroceries app to the same OurGroceries account. Note that this account is not related to your Apple or Google account. This is a separate account that you have with us. The account is identified using an email address. Choose a single email address for the household. It can belong to anyone in the household, but list sharing will only work if you use a single email address. If you enter two different email addresses in two members’ apps, they’ll be on different OurGroceries accounts and their lists won’t be shared with each other. To create an account or to add someone to an account, run the OurGroceries app, then go to the Settings menu, choose “Sign in”, and follow the instructions. You’ll be asked for your email address. Remember to use the same email address on all phones. You’ll then be asked for your password (either to create an account or to sign in). If your account already exists, you can also reset your password or send yourself a magic email to sign you in. You’ll also be asked whether you want to copy your exising lists (the ones already in the app) into the account you’re signing into. If you intend to join two accounts, then choose to copy the lists. If you just want to switch to a different account and keep them separate, then choose to not copy the lists. To remove someone from your account, sign in to the website, go to the “Settings” link in the upper-right, and delete the device from your account. Learn more about using the website. If you find that your lists are not synchronized despite following the above instructions, contact us and we’ll help you out. When you’ve decided to make a recipe, review the items. Tap the items that you’ll need to buy, and they’ll be added to your shopping list. The first time you do this, OurGroceries will ask you which shopping list each item should be added to. (It won’t ask if you only have one shopping list.) It’ll remember your choice for next time. This is handy if, for example, you buy your bread from the grocery store but the meat from the butcher. If you think you need all or most of the ingredients, you can add all of the ingredients at once to the various shopping lists to which they belong. To do this on iPhone, tap the button at the bottom of the screen labeled “Add recipe to shopping list”. To do this on Android, tap the menu button at the top right, then select “Add recipe to shopping list”. Recipes can have other uses as well. For example, if you buy the same set of things every week, then you can create a “recipe” with these items and add them to your shopping list with one tap. You could also have a recipe of things you need to pack for an airplane trip, add them with one tap to a “Get ready” shopping list, then cross off items as you pack them. To create a shopping list, go to the top-level screen (the one that shows all of your shopping lists and recipes) and tap the line labeled “Add a shopping list...” at the bottom of the list of shopping lists. Each shopping lists must have a different name. Typically shopping lists are named after various stores you shop at, but that’s entirely up to you, and some people create shopping lists for to-do tasks and other shared lists. To create a recipe, go to the top-level screen (the one that shows all of your shopping lists and recipes) and tap the line labeled “Add a recipe...” at the bottom of the list of recipes. Each recipe must have a different name. On the website, the two buttons to create shopping lists and recipes are located above the list of shopping lists. On iPhone: Go to the top-level screen (the one that shows all of your shopping lists and recipes), tap the to the right of the shopping list or recipe you want to delete, then tap “Delete Shopping List” or “Delete Recipe”. On Android: Visit the shopping list or recipe itself, tap the menu icon in the upper-right (looks like  ), then tap “Delete list” or “Delete recipe”. On the website: Visit the shopping list or recipe itself, then click the “Delete List” or “Delete Recipe” button at the bottom of the page. On iPhone: Go to the top-level screen (the one that shows all of your shopping lists and recipes), tap the to the right of the shopping list or recipe you want to rename, enter the new name, then tap “Done” on the keyboard. On Android: Visit the shopping list or recipe itself, tap the menu icon in the upper-right (looks like  ), tap “Rename list” or “Rename recipe”, then enter the new name. On the website: Visit the shopping list or recipe itself, then click the “Rename List” or “Rename Recipe” button at the bottom of the page. The OurGroceries app is free, but we show ads in a few screens in order to help pay for continued development. If these ads bother you, or if you’d like to support development directly, you can upgrade. This does not require you to download another app or lose your lists. Upgrading is not required in order to use most of OurGroceries, including all the basic features and list sharing. All premium-only features are clearly marked in this user guide with a heart like the one on the left. All other features are available free. The price of upgrading depends on the country, but is about US$5. It is a one-time payment. Upgrading is done through your device’s app store (the App Store on iPhone, the Play Store on Android), and it handles all payment. It also keeps track of the fact that you’ve upgraded, so that you can upgrade again later for free if you get a new phone. The upgrade is tied to your app store account, however. Just because you share your OurGroceries lists with your partner does not mean that your upgrade will apply to them. We are not permitted to extend upgrades to all devices in the OurGroceries account. To upgrade on iPhone, go to the top-level screen of OurGroceries, tap the Settings icon (), then tap “Turn Off Ads”. From this screen you can buy the upgrade. If you had previously bought the upgrade using this App Store account, then you can tap “Restore” to restore your upgrade. Note that Apple does not permit in-app purchases like this one to be shared using Apple Family Sharing. To upgrade on Android, tap the menu icon in the upper-right (looks like  ) of any screen of OurGroceries, tap “Settings”, tap “Turn Off Ads”, then tap “Upgrade”. You’ll be taken to the Play Store to purchase a separate app called “OurGroceries Key” (buy it now). This app is not a replacement for the main OurGroceries app. It has no interface, and you do not launch it yourself. Its presence on your phone causes the main OurGroceries app to be upgraded. There’s no direct way to upgrade the website version of OurGroceries, but if you upgrade the OurGroceries app on any mobile device (iPhone or Android) in your account, the website will be considered upgraded and will no longer show ads. By default all new items are uncategorized. If you’d like you can assign items to categories, and they will by grouped by category in the shopping list. For example, if you assign “milk” and “cream” to the “Dairy” category, then both will show up together in the “Dairy” section of your shopping list. This can make shopping easier, since dairy items are often located near each other in the supermarket. Although the default category names are things like “Dairy” and “Produce”, some people use aisle numbers instead, like “Aisle 1” and “Aisle 2”. Remember, though, that categories are the same across all shopping lists. That means that (for example) “tomato soup” will be in “Aisle 4” for all lists, even though tomato soup may be in different aisles in different stores. Using aisles for categories works best if you do most of your shopping at the same store. On iPhone: While looking at a shopping list, tap the “Edit” button at the lower-right. Handles will show up at the right of the item names (looks like ). You can drag items by their handles. When finished, tap the “Done” button at the lower-right of the screen. On Android: While looking at a shopping list, open the menu by tapping the menu button in the upper-right (looks like  ). From this menu select “Rearrange items”. Handles will show up at the left of the item names (looks like ). You can drag items by their handles. When finished, tap the left-facing arrow at the top-left of the screen. On the website: While looking at a shopping list, move your mouse cursor to hover over the item you’d like to move. A handle (looks like ) will appear at the left of the item. Drag this handle to move the item to another position in the list. Once you rearrange items, we remember this new order for the next time that you create a shopping list. If you’re using categories, you can also drag items to another category in order to categorize them differently. Each shopping list and each recipe can have an attached note. For a shopping list the note might include the store’s address and other generic store information. For a recipe you could store the steps in the recipe and a web link to where you originally found it. On iPhone: While looking at a shopping list or recipe, tap the button centered at the bottom. It looks like a square with a pencil. You can then tap the “Edit” button in the upper-right to edit the note, then “Done” when finished. On Android: While looking at a shopping list or recipe, tap the menu button in the upper right (looks like  ), then tap “View list notes” or “View recipe notes”. From there you can edit the note and tap “Save” when done. On the website: The note is visible at the bottom of the shopping list or recipe. Click the “Edit Notes” button below it to edit the note, then tap “Save Notes” to save it. You can add a photo to each item. This is useful if you want to be sure that your partner gets exactly the item you have in mind. On iPhone: Tap the to the right of the item name. On the displayed screen, tap the camera icon in the lower-left of the screen. You’re then given a choice of taking a photo with the camera or choosing a photo from your photo album. Select an option, then either take the photo or choose one. To remove a photo from an item, tap the “Remove Photo” button below the photo. On Android: Tap the to the right of the item name. On the displayed screen, tap either the “Take Photo” button to take a new photo with the camera, or the “Choose Photo” button to choose a photo from your photo album. Double-tap the photo to zoom into the spot where you tapped. Double-tap to zoom back out. To remove a photo from an item, tap the “Remove Photo” button below the photo. On the website: Click the to the right of the item name and click “Add photo”. To remove a photo from an item, click the “Remove photo” button above the photo. Items that have photos will show a small thumbnail in the shopping list. You can tap that thumbnail to see the full-size version. Barcode scanning is not currently available in our iPhone app. OurGroceries has a database of 17 million products and their barcodes (UPC). You can scan a barcode using your phone’s camera and OurGroceries will look it up in its database. If it’s found, the item’s name will be added to your shopping list. To scan a barcode, go to the shopping list to which you’d like to add the item and tap the barcode icon at the top of the screen. This will take you to a separate app called “Barcode Scanner”. If you do not have this app installed on your device, you will be prompted to install it. Aim your device’s camera at the product’s barcode. Once the barcode has been scanned, the scanning app will display the message “Product found”. This is a misleading message because it does not mean that our database has recognized the product. It only means that the numbers were read from the barcode. If the barcode is not in our database, you will see a message telling you that the barcode is unknown and giving you the option to add the item manually. If you tap “Add Manually”, you will be taken to the normal screen where you can type a new item’s name or choose one from the existing list. Once you type or select an item, it will be added to your shopping list and the scanned barcode will be associated with it. The next time you scan that barcode, that item will be added to your list directly. It won’t be looked up in our database. If you’d like to remove a barcode from an item in your shopping list, tap the to the right of the item and tap the icon to the right of the barcode. To associate a barcode with an existing item, tap the to the right of the item and tap the barcode icon at the top of the screen. You’ll be able to scan a barcode with your camera as described above and the barcode will be associated with that item. The next time you scan that barcode, that item will be added to your list directly. It won’t be looked up in our database. Shortcuts only work with the Android version of OurGroceries. Shortcuts are icons on your home screen that go directly to certain lists within OurGroceries. You could have multiple shortcuts, one for each store that you visit frequently. A shortcut can also go straight to the “Add an item” screen for a particular list. Drag one or the other depending on whether you want a shortcut that jumps to a list or jumps to adding an item to a list. On versions of Android older than 7.1, to create a home screen shortcut, go to a shopping list or recipe, open the menu, and tap “Create shortcut”. You’ll be given the option of creating a shortcut that goes straight to your shopping list or recipe, or creating one that goes to the “Add an item” screen for that shopping list or recipe. To delete a shortcut, long-tap it and drag it to the “Remove” label at the top of the home screen. Widgets only work with the Android version of OurGroceries. Widgets give you the ability to see a shopping list right on your home screen. You can tap items to cross them off and tap "Add an item" to add a new item to a list. To create a widget, long-tap your home screen, choose “Widgets”, and scroll down to find “OurGroceries” (or “Shopping List” on some devices). Long-tap the widget and drag it wherever you’d like on your home screen. If you have multiple shopping lists, you’ll be asked which one you want to show. You can long-tap the widget to change its size. Tap items to cross them off, tap the name of the list in the header to jump straight to the list, and tap the plus (+) sign in the header to add an item. To delete a widget, long-tap it and drag it to the “Remove” label at the top of the home screen. You can see and edit your lists on the OurGroceries website. Click the Your Lists tab at the top of this page. You will be asked to sign in to your account. Enter the same email address that you use to share lists amongst family members with the mobile app. The mobile app does not require a password, but the website does. The first time you try to sign in, click the “please create an account” link. OurGroceries will make up a random password and email it to you. Use that password to sign in on that same page. If you don’t get an email from us, check your spam folder. If the email isn’t there either, contact us for help. If you’ve forgotten your password, click “please make up a new one and email it to me”. We will make up a new password and email it to you. Once you’ve signed in, you can see your lists and edit them much like you can in the mobile app. You can change the email address you use for your OurGroceries account by entering your existing password and your new email address. You can change your password by entering your existing password and your new password (twice). You can change various settings that affect how the website works. These mirror the same settings in the mobile app. See the specific section for each setting in this user guide. You can delete your OurGroceries account. Note that this is permanent and cannot be undone. Any device signed in to your account will lose their lists. At the bottom of the page is a table of all the devices that you’ve ever added to your account. You can click the next to a device to remove it from your account. This will create a new empty account for that device and copy all of your lists to that account. Any changes made to the lists on that device will stay on that device and no longer affect yours. You’ll need your OurGroceries master email address and password. If you don’t have a password, create one first. Launch the Alexa app on your mobile phone, open the menu on the left, tap “Skills”, then search for “OurGroceries”. Tap the “Enable” button to enable the skill. The Alexa app will ask for your OurGroceries master email address and password. This information will go straight to OurGroceries. Alexa will not know your password, and your information will be transmitted securely to us. Enter the information from step 1 and tap “Sign In”. If you’re having trouble adding items to OurGroceries using Alexa, then see this answer. If there’s a request that the skill didn’t understand, please contact us and let us know what it was. We’d love to hear how our voice interface can be more useful to you. To remove your Alexa device from your OurGroceries account, visit your Settings page on our website, scroll down to find the list of devices on your account, find the one called “Amazon Alexa”, and click the to the right of it. Say to your Google Assistant device, “Ok Google, talk to OurGroceries.” You’ll be asked to link your OurGroceries account. Launch the Home app on your mobile phone. The Home app will ask for your OurGroceries master email address and password. This information will go straight to OurGroceries. Google will not know your password, and your information will be transmitted securely to us. Enter the information from step 1 and tap “Sign In”. To remove your Google Assistant device from your OurGroceries account, visit your Settings page on our website, scroll down to find the list of devices on your account, find the one called “Google”, and click the to the right of it. If you’re having trouble linking your Home or Assistant to your OurGroceries account, see the troubleshooting help. If you don’t specify a shopping list, OurGroceries will add it to your default shopping list, which you can set in your Settings page (on our website) in the “Voice settings” section. If you’ve not set a default list, you will be asked which list to add the item to. You can use the Siri interface from the lock screen of your phone. On the Apple Watch you must first install the OurGroceries watch app and complete the setup process. See instructions here. Our Siri interface is relatively new, so we’re interested in hearing about any problems you might have with it. We’re especially interested to know if Siri is having a hard time understanding the name of the shopping list you specified. Don’t hesitate to contact us. You can see your lists on your Apple Watch. If you have configured your phone to install all Apple Watch apps automatically, then it will show up on your watch’s home screen. If not, you should run the Watch app on your iPhone and install the OurGroceries watch app. The first time you run the Apple Watch OurGroceries app, it will ask you to open the OurGroceries app on your iPhone. (See here if this step doesn’t work.) 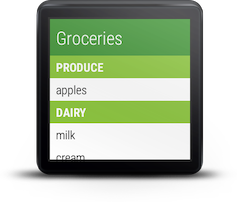 Your shopping lists will appear on your watch, and you’ll be able to cross items off and add items using your voice. After this first time, running the OurGroceries app on your iPhone will not be necessary. If the watch has a connection to the Internet (either directly or through your iPhone), it will keep your lists in sync with all the other devices signed in to your OurGroceries account. To add an item to your list, either tap the “Add an item...” row or deep-press the shopping list screen. You will be prompted to say the item’s name using your voice. If your shopping list is very long, only the first few dozen items will be shown. Tap the “Show all items...” row to display the rest of the list. 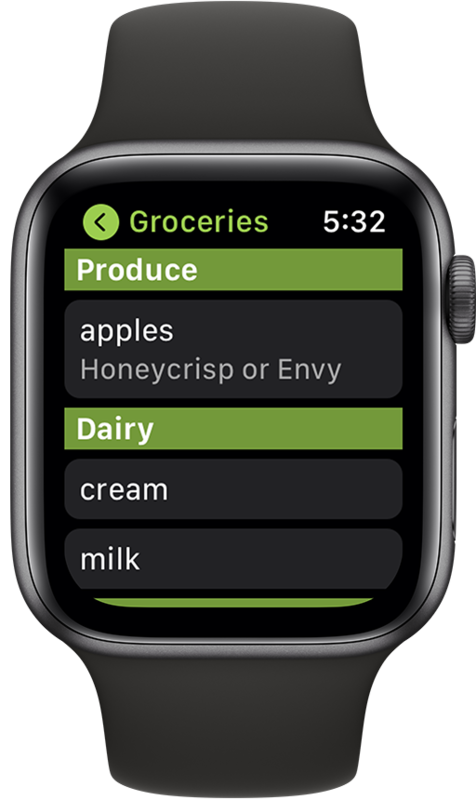 You can add an OurGroceries complication to your watch face for quick access to your lists. Under General → Wake Screen, adjust “On tap” to “Wake for 70 Seconds”. Under General → Wake Screen, adjust “On screen wake show last app” to at least “Within 2 Minutes of Last Use”. The Android Wear app currently only works with Android phones. You can see your lists on your Android Wear watch. If you have a Wear device, the OurGroceries app will be installed on it automatically and your lists will be visible on it. You can tap items to cross them off, and tap “Add an item...” to add an item by voice. Each item will be added to your list or recipe as if you had added it individually. Instead of typing the list manually, you can upload a file from your computer. To do this, click the “Choose File” button at the bottom of the window and find the file you’d like to upload. The file should follow the same guidelines just described—a plain text file with one item per line. If you’ve used the app Out of Milk in the past, you can export your lists from there and import them here. Not all of the data will be kept. For example, OurGroceries does not currently have notes for each item. You can export all of your data. This includes your shopping lists, recipes, the master list of all the items you’ve ever added, and the list of categories. The data is downloaded as a ZIP file that contains a README.txt file that explains the contents of the ZIP file, the data in Microsoft Excel format (XLSX), and the data in JSON format. Currently this is an export-only feature—you cannot modify this data externally and re-import it back into your account. On iPhone: If you’re looking at a shopping list or recipe, tap the back (left-facing arrow) button in the upper-left to reach the top-level list-of-lists. From there, tap the gears button in the upper-left of the screen. On Android: From any screen, tap the menu button in the upper-right (looks like  ), and select the last option, “Settings”. On the website: Once signed in, click the “Settings” link in the upper-right of the page. The rest of this user guide describes all of the available settings. The “About” screen in “Settings” (available on the iPhone and Android version of OurGroceries, but not on the website) shows the OurGroceries app version number and convenient buttons for getting help and rating the app. The screen also tells you how long it has been since the app was able to reach our server. The app uses our server to back up your data and to pass your changes on to other devices in your household. If your device can’t reach our server, then your changes won’t be visible to others, and others’ changes won’t be visible to you. The app tries to contact the server every 20 seconds when the app is open on your phone. The “About” screen should say something like, “Last connection to the OurGroceries server was 7 seconds ago.” If the time is longer than 20 seconds, or if it says, “There has not been a connection to the OurGroceries server since this app was launched,” then you should check your Internet connection. Perhaps you are off-line, or you asked your device to not permit OurGroceries to contact the Internet. Check the phone’s own Settings app. There’s no equivalent screen on the website because ads on the website will automatically be turned off if any mobile app in the account has upgraded. Note that this screen is not available on the website, because just signing in to the website establishes which OurGroceries account you want to use. The “Item categories” screen in “Settings” lets you edit and rearrange the item categories. On iPhone: To add a category, scroll down to the bottom of the list and tap “Add a category...” To rename a category, tap its name. To delete a category, tap the at the left of the row. To rearrange a category, drag it by the bars at the right of the row. On Android: To add a category, scroll down to the bottom of the list and tap “Add a category...” To rename or delete a category, tap the at the right of the row. To rearrange categories, tap the double arrows at the top-right of the screen, drag rows by their bars, then tap the left-facing arrow at the top-right. On the website: To reach this screen, visit any shopping list, then click the “Manage categories” button above the list. To add a category, scroll down to the bottom of the list and click “Add a category...” To rename or delete a category, click its name. To rearrange a category, hover over the row with your mouse and drag it by the bars that appear at the left. The “Sort list of lists” options in “Settings” let you control the order OurGroceries shows shopping lists in the top-level screen. The default is to list them alphabetically. This option lets you instead put all shopping lists with items at the top, and empty lists at the bottom. (Within these two groups they will be listed alphabetically.) This makes it easier to find lists that have items that need to be purchased. While shopping it can be frustrating to hold the phone and have the screen orientation switch between vertical and horizontal whenever the phone is tilted. This option lets you lock the screen orientation. On iPhone: This option is called “Lock Orientation to Vertical”. It will force the screen to the vertical format while running OurGroceries. On Android: This option is called “Lock screen orientation”. This will force the screen to the natural orientation of the device (vertical for phones, horizontal for tablets) while running OurGroceries. This setting is not available on the website. The “Sort shopping list items” option in “Settings” gives you some control over the order that OurGroceries lists items in shopping lists. Once items have been rearranged, however, they stay in that fixed order. This can cause some unexpected behavior. For example, let’s say that you add items “bacon”, “cream”, and “dates” to your list. You then rearrange the items to put “cream” first, then rearrange them again to put “cream” back between the other two items. This order will now be fixed. It happens to be alphabetical, but that, to OurGroceries, is just a coincidence. If you then add “apple” to your list, OurGroceries doesn’t know that the most natural place is at the beginning. So it puts it at the end. In fact all new items will show up at the end, alphabetized. You will end up with two parts to your list: the first that has a fixed order, and a second that’s alphabetized. Fixing the item order this way may not be what you had intended. You may have used drag-and-drop not to reorder items, but to put them into different categories. When this happens, you can use this setting to force OurGroceries to always show items in alphabetical order. Note that when you enable this setting, drag-and-drop will still work, but you will only be able to use it to move items to different categories. This setting is not yet available on the website. On the website, items are always ordered “By drag and drop”, meaning in the fixed order you specified when you reordered items. “Alphabetically” lists crossed-off items in alphabetical order. This is useful if you use your list of crossed-off items as your source of items to add to your shopping list. “Recently crossed-off at the bottom” puts items that were recently crossed off at the bottom of the list. “Recently crossed-off at the top” puts items that were recently crossed off at the top of the list of crossed-off items. This is the default option for this setting. The main benefit of this option is to be able to quickly find an item that was accidentally crossed off. It’ll be at the top, where you can tap it again to uncross it off. The “Cross-off action” option in “Settings” lets you choose what action you need to take to cross an item off your shopping list. By default this is a simple tap. If you find that you too easily cross items off while shopping, then you can use this option to require an action that’s less likely to be performed accidentally. On iPhone: The alternative action is “Swipe”, which means swiping your finger horizontally across the item in either direction (left to right or right to left). On Android: The alternative action is “Long press”, which means holding your finger on the item for half a second. The “Show keyboard” option in “Settings” lets you control whether the on-screen keyboard is shown automatically after tapping “Add an item...” to add an item to your shopping list. By default this option is enabled. You may wish to disable it if you rarely type items but instead prefer to choose them from your master list. If you’ve disabled this option, you can force the keyboard to be shown by tapping the item name box at the top of the “Add an item” screen. The master list is the list of all the items you’ve ever added to any list in OurGroceries. It’s the list you see when you tap “Add an item...” to add an item to your shopping list. This option lets you control the order and grouping of these items in the “Add an item” screen. By default, the master list is ordered so that the most frequently-added items are at the top of your list. This makes it easy to add these items next time you make a list. You might prefer, though, to order the list alphabetically, especially if you don’t like to tap the first few letters of the item name. Also by default, the master list is shown as one single big list. You might prefer to show them grouped by category, so that, for example, all “Dairy” items show up together. This makes it easier to browse the master list, looking for items that you might need to get. Note that if you group by category but sort by common items first, then each category will show its own common items at the top. On iPhone: This setting is called “Arrange Master List”. Choosing this setting shows you a screen where you can pick your sort and grouping preferences. On Android: These are two separate settings, called “Sort master list” and “Group master list”. On the website: Only the sort option is available. Grouping by category has not yet been implemented. The “Add multiple items” option in “Settings” lets you choose to be able to add more than one item at a time to your shopping list. By default, when adding an item from the “Add an item” screen, tapping an item both adds it to your list and closes that screen, returning you to your shopping list. With this option enabled, the screen will not close. You’ll be able to tap other items. On the website this option is not in the “Settings” screen, it is on the “Add an item” pop-up window. This option is not available on the iPhone. If you enable this option then OurGroceries will prompt you for the category of an item you’re adding, if it’s not categorized yet. This saves you a step and streamlines the process of categorizing all of your items. The “Capitalize items” option in “Settings” lets you choose whether newly typed-in items should be capitalized or not. By default this option is off. If you type the word “cookie” when adding an item, it will show up as “cookie”. With this option enabled, the word will be capitalized to “Cookie”. This option is only available on Android. It is always enabled on the iPhone. The “Extend screen timeout” option in “Settings” lets you extend the normal short screen timeout. This option is turned on by default. With the option off, the screen will turn off by itself after a short period, normally within about one minute. This is fine for normal phone use, but at the grocery store it can be annoying to turn the screen back on between each item. When this option is enabled on Android (and always on iPhone), the timeout is extended to ten minutes while using the OurGroceries app. This option is only available on Android. The “List row size” option in “Settings” lets you set the size of the font and row for items. The default is “Normal”. Set it to “Small” to fit more items on the screen, or to “Large” to see the items more clearly. The “Theme” option in “Settings” lets you set the look of OurGroceries. There are three free themes (Dark, Light, and Fresh) and eleven premium themes. Tapping a row in the theme chooser shows you what the theme will look like. Tap OK to select it.